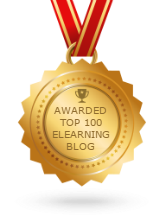 It is with much pride that I share the news that I have won the LearnX Best Learning Leader Blog award! 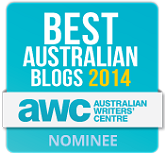 This is a very prestigious award in the Asia-Pacific region, and I am honoured to nominated let alone be selected. Congratulations to my fellow winner in the category, Ainslie Hunter, who authors the excellent blog Courses That Matter. I wish to thank everyone who nominated me. I’m glad you think so highly of my contribution to the discourse. I also wish to thank those who have taken the time to add comments – both positive and negative. The life blood of a blog isn’t just the thoughts and experiences of the blogger, but also his interactions with his peers. Best Learning Leader Blog award at LearnX Asia Pacific. Thanks again to everyone who has nominated me, and I’m sure any further nominations wouldn’t go astray! 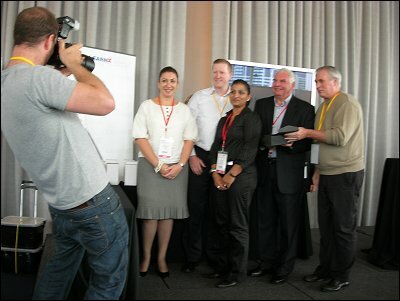 This week I attended the 2010 LearnX Asia Pacific Conference in Sydney. While I jotted down reams of notes, I’m a big fan of one liners. Jane Bozarth – Pre- or post-questioning your learners via Twitter stops them from rambling. Philip Roy – Massey University uses pre-recorded presentations and realtime web conferencing to reduce the transactional distance among their geographically separated students and instructors. 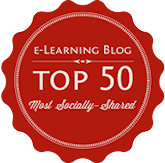 Roger Courville – Twitter can support informal learning outside of formal training sessions. Miriam Scurrah – Technologies like iClone can make safety training enjoyable. Ruth McElhone – Rapid authoring tools make in-house development a feasible option. 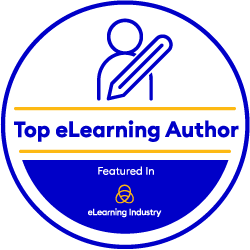 Chad Outten – Moodle is the #1 LMS among eLearning Guild members. Tania Tytherleigh – The connection you make with your learners is more important than your experience or your expertise. Rhys Moult – A little bit of HTML goes a long way. Helena Popovic – Excitement is food for your brain. Ramesh Nava – The fundamentals of assessment are validity, reliability and fairness. Dawid Falck – User generated content is really powerful. Anne Moore – Don’t think a degree will get you a job; it might get you an interview. Eric Shepherd – Identity impersonation during e-assessment can be combated by invigilation and microcertification. 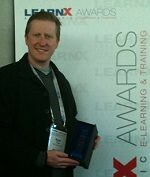 Today I had the honour of collecting a Best Blended Learning Solution Award (Gold Level) at the 2010 LearnX Asia Pacific Conference. The blended learning solution in question is “IQ”, an intranet-based portal that I developed for my colleagues at my workplace. My driver for creating this portal was the realisation that, in a big corporation like the one I work for, knowledge is distributed everywhere – on random intranet pages, in obscure folders, in people’s heads – which makes it really hard to find. As an L&D professional, my concern was: if someone wants to learn something, where do they start? Essentially, IQ is a site that centralises learning resources for staff. It doesn’t host content itself, but rather points you in the right direction. For example, if you want to attend an advanced negotiation skills workshop, you can look up the sessions delivered by our preferred training providers. If you want to read about leadership, you can refer to our book list or search our e‑book catalogue. If you want to do a self-paced course on Java programming, you can jump onto our e-learning platform. In this way, IQ covers the full range of delivery modes that are available to our staff, from face-to-face classes and online courses, to books, e‑books, podcasts, blogs, wikis and other social media. I’m also keen to add information about our mentoring and coaching programs. It’s our first port of call for learning. Reading this, you might be scratching your head and asking yourself what all the fuss is about. I’m the first one to put up my hand and say, as a blended learning solution, IQ is really simple. It doesn’t involve any new whizz-bang technology. After all, it’s an intranet site. But dig a little deeper and you’ll see that it’s also an important step in the evolution of the learning model at my workplace. It shifts an instructivist pedagogy towards a more constructivist and connectivist one. It transforms a formal learning environment into a more informal one. It returns the power (and responsibility) of learning back to the learner. That’s why I’m so pleased to claim this award. It’s not just a pretty trophy to sit on my desk; it’s the validation of my instructional design by my peers in the industry. 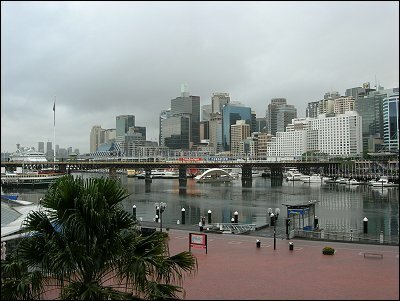 I attended the annual LearnX Asia Pacific conference this week at Sydney’s Darling Harbour. The Magic of Speed Thinking: Ken Hudson, Director of The Speed Thinking Zone, kicked off proceedings with a keynote address about working smarter, not harder. Ken’s central theme is that being able to think faster and better can help us unlock ideas and improve our productivity. Maintaining that “our brain works better when our bodies are moving”, Ken got everyone in the room to participate in a few ice-breaker activities involving coin catching and brainstorming answers to pop questions. I must admit, it lifted the energy of the room. Ken then introduced a 9-circle template with the question “In these tough economic times, why should we invest more into training?” – and asked us to list 9 possibilities in 2 minutes. The idea isn’t necessarily to achieve a full gamut of answers, but to get the party started quickly. I think Ken’s ideas have real potential for expediting meetings and stimulating brainstorming sessions, but I still think that careful thought and deep reflection are necessary follow-ups. For more information about speed thinking, visit Ken’s website and refer to his book The Idea Generator. Bringing Generations Together through Collaboration and Informal Learning: Faith Legendre, Senior Global Consultant at Cisco WebEx, provided the audience with a synopsis of our 4 major generations today (Generation Vet, Boomers, Gen Y & Gen X), and an overview of their changing learning styles over time (push to pull, formal to informal, comprehensive to nibblets, and physical classes to online). While Faith recognised that generational attributes are widely disputed (eg online habits are not defined by age but by exposure to emerging technology), her key message is that people across all generations are using technology today to bridge gaps and collaborate. Faith also highlighted the technology collaboration community at Cisco Community Central. How to capture evaluation data to prevent costly e-learning deployment failures: Susan Pepper, Managing Director of the ROI Institute of Australia, reinforced the need for rigorous evaluation to ensure the success of e‑learning. Susan adheres to 5 levels of feedback, comprising Kirkpatrick’s four levels of evaluation, plus the calculation of return on investment (ROI). Susan also recommends that evaluation data be collected not only post implementation, but also during implementation to remedy any problems as they arise. Another key message is that e-learning programs require thorough planning, particularly to determine the organisation’s need, which in turn should inform the objectives of the solution. Learning without boundaries: Ben Saunders, Business Analyst Consultant at HCS, provided us with a comprehensive overview of m‑learning. While pointing out that m-learning started as far back as 3000BC when the Sumerians carved out text onto portable stone tablets, Ben recognises that the increasing sophistication and decreasing cost of mobile devices (eg smart phones) are making m-learning more relevant today. Ben categorises the limitations of m‑learning under three major banners: hardware (screen size, usability, information security), software (multiple operating systems, unsupported file formats, SCORM compliance) and culture (work/life balance and the digital divide). However, he also notes that learners are already using mobile technologies in their general day-to-day activities, leading them to expect to do likewise for education. Extending your reach: Learning at a distance: Glen Hansen, National L&D Manager at Employment Plus, shared his organisation’s experience of using web conferencing to transition from traditional face-to-face learning delivery to a blended model. While the transition period was challenging (learning curve, lost skills through staff turnover), Glen cites significant benefits, such as: enhanced collaboration, enablement of JIT learning, consistency of message and reduced single point sensitivity. Glen also shares some practical tips for webconferencing, such as: conduct a needs analysis before launching web conferencing, trial potential software prior to selection, enquire whether the provider includes training in their package, appoint a moderator to support the facilitator during sessions, freeze the webcam to save bandwidth, use plenty of graphics, and provide opportunities for the learners to interact with one another. 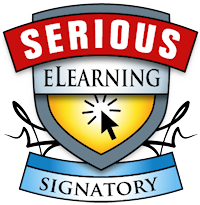 Glen also recommends The eLearning Guild’s Handbook on Synchronous e‑Learning. Selling e-learning to your clients: A culture change approach: I must admit that I felt like I had walked into the wrong session, as Ingrid Karlaftis, National Account Executive at Catapult E-Learning, adopted the vendor’s perspective of selling an e-learning solution to an organisation. However, I think Ingrid’s key messages can help e-learning practitioners within organisations, especially when implementing a project or major initiative. For example: never over promise and under deliver, work hand-in-hand with your clients along the journey, identify the needs of each team across the business (they will be different! ), promote the notion of “one community”, train the trainer, maintain your transparency, provide constant support, measure and report. Professional Audio – The Key to Effective E-Learning: This was a shameless sales pitch, but to be fair, the presenters didn’t pretend otherwise. Adam Morgan and his crew promoted the advantages of employing professional actors (rather than “Tim from Accounts”) to produce the voiceovers in your e-learning courseware. Why? Because actors are better skilled at engaging your audience. Adam has a point in that an outfit like Voiceoversonthenet can cater for different audiences through variables such as accent, tone, gender and pace. So should you use an actor? Well that’s up to you. Learning Leaders Panel: The final session on Day 1 was a facilitated discussion about building talent and learning anytime, anywhere, at any pace. Among the topics discussed: Bob Spence observed that informal learning relies on trust that the material being learned is worthwhile; Rob Wilkins shared his view that the feudal management system of a typical corporation inhibits its use of social media for learning; Anne Moore suggested that organisations need to become more like Gen-Y’s to support the next generation of employees who will lead us beyond the GFC; John Clifford informed us that every Telstra field technician has a laptop and a mobile device to enable e-learning on the road; Ann Quach recommended that we focus on content, then its mode of delivery (avoid using a blog or wiki just because it’s the latest fad); and Wendy John reminded us to empower staff to learn when they need to, otherwise engagement will be low and the experience will be a waste of time. Stay tuned for an overview of Day 2…! The annual LearnX E-Learning & Training Awards were announced today, and I’m proud to say that my team won a Gold award for Best Training Team, for our development and support of a self-paced, blended learning model at AMP. We’re in good company, with the Australian Red Cross Blood Service taking out the Platinum award, and the Commonwealth Bank and TheCyberInstitute also claiming Gold. Congratulations also to the winners of the other categories, including the AMP Horizons Financial Planning Academy which won a Gold award for Best Employee Induction Training Program.